King James Bible. 1611. Folger. My two favorite categories of English language idioms are those derived from printing and those derived from baseball. I can find no excuse for discussing baseball terms and phrases in a blog devoted to the King James Bible, so I’ll simply provide you with this link to Wikipedia and move on to printing. One of the happy byproducts of the history of bookmaking is the bits of language that have traveled out of the printing house and into our common English parlance. Calling letters upper and lower case, for example, comes from the physical arrangement of the two type cases that held majuscule (capital or upper case) letters and minuscule (lower case) letters. For a visual aid, check out these photos from the Bodleian Library. Other common idioms that may have bibliographic roots are “out of sorts” and “mind your p’s and q’s.” I have small children, so I often find myself talking like I’m in a printing house. The truth is, however, that the jury is out on these origins of these phrase, but The Happy Dragons’ Press is on the case (please note that “on the case” is not a printer’s term). Another common bibliographic idiom travels back centuries to early manuscript Bibles. Today the term “red-letter day” is often used to donate special days of any sort, but it has its origins in liturgical calendars found in manuscript and printed Bibles. While most of the days of the calendar were written or printed in black ink, the more special days were emphasized by being written or printed in red ink. These red-letter days typically included saint’s days and other festivals. Like most Bibles that came before it, the King James Bible includes a calendar. 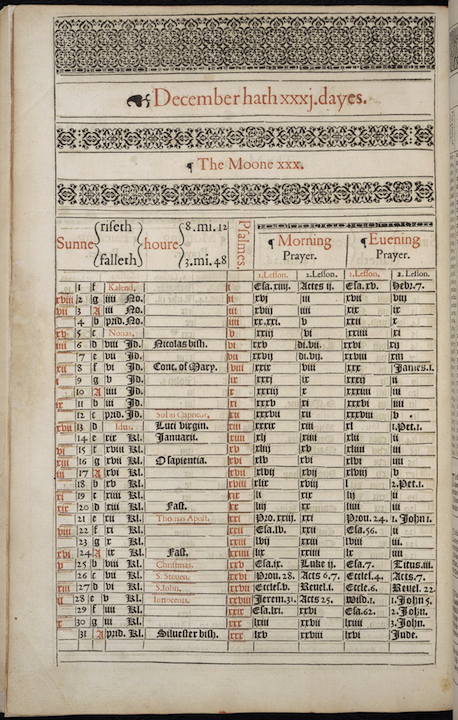 The page from the 1611 King James Bible shown above in full (with a close-up view here) is for the month of December, which happens to contain a number of red-letter days—including, of course, Christmas. Steven Galbraith, Curator of the Cary Graphic Arts Collection at Rochester Institute of Technology, is co-curator of the Manifold Greatness exhibition at the Folger Shakespeare Library. NOTE: For audio comments from Steven Galbraith on how the printer used black and red inks on this calendar page (and for a closer look at the page itself), go to Read the Book on the Manifold Greatness website; select “December calendar” from the Choose a Page menu. Read the Book is also available at a computer station within the Manifold Greatness exhibition, on view at the Folger Shakespeare Library through January 16. This entry was posted on December 19, 2011 by curatorsteve. It was filed under From the Curators, Influences and was tagged with calendar, Christmas, idioms, King James Bible, printing, red-letter day.